Indonesia is an ethnically and culturally diverse country with almost 260 million of people spread across more than 17000 islands. Along with the significant economic growth of the country on the past decade, the energy consumption is also steadily increasing altogether with the emissions of greenhouse gases, pushing Indonesia into the 7th largest emitter in the world (Friedrich et al., 2015). Around thirty per cent of Indonesians are farmers and impacted by climate change bearing rising temperatures and decreasing precipitations. Most of these farmers are cultivating rice and other staple crops, which are highly impacted by the significant increases of temperatures and decreasing precipitations, e.g. ca. 1°C hotter since 1990. The farmer’s dependency on rain-fed rice paddy could harm them in the future because of the scarcity of water and harvesting could only be done once a year. These future projections of climate exacerbate two existing problems; (1) high energy consumptions on rural household and (2) farmers’ reliance on rice paddy as the main crop. 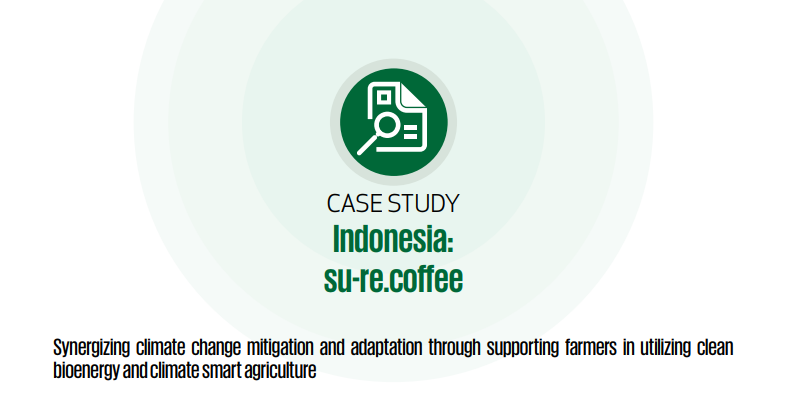 This case study focuses on su-re.coffee, a project led by an environmental think-tank, su-re.co, in Jembrana areas in western part of Bali, which is accountable for roughly thirty per cent of the total rice production of the island.